Klamath River fishing is holding pretty steady for Ironhead Guide Service. We have definitely completed the transition into our winter holes. The fish have all moved into the deep slow water and have been a little picky with their diets. One day they will want the plugs and the next day they won't even sniff em. 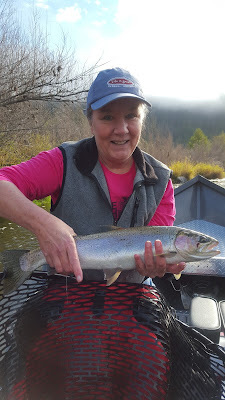 The low and clear water conditions coupled with the cold weather have made for some tuff bites but if you be patient and have faith in you gear you will be rewarded like the happy customers below. We have dates left for December and soon we will be booking our trophy winter steelhead season so you better get on the calendar. Klamath River Fishing reports are showing signs of a transition. We have been working the middle and lower sections of the river and have finally started to see a few winter steelhead. We have been getting rain every few days and the river is starting to turn green and come up a little bit. The spawning beds are starting to be ghosts towns and the metalheads are spreading out on us. Side drifting and plugs have been producing fish for us and I have the river all to myself. Let's go get some fish, we have lots of guides with days open in December so give us a call today to book you Klamath River Adventure. 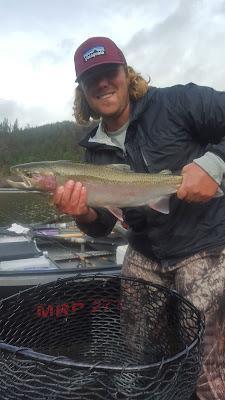 Klamath River Fishing continues to be steady for Ironhead Guide Service. We have late Chinook still spawning, coho biting for some crazy reason, and lost of adult steelhead tugging on the ends of our line. We are seeing some fish moving into the typical steelhead holding water and taking up residency in there winter holes. 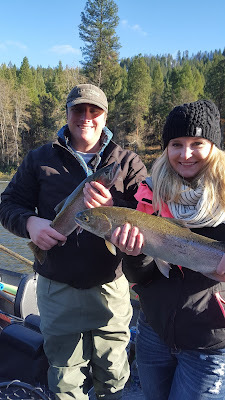 December is looking pretty good for winter steelhead on the Klamath River and we have lots of guides available so lets go work off some of that holiday food.